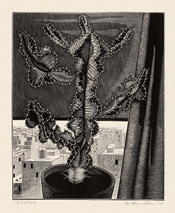 Cactus - - 1934, Wood Engraving. Edition not stated. Signed, dated and titled in pencil. 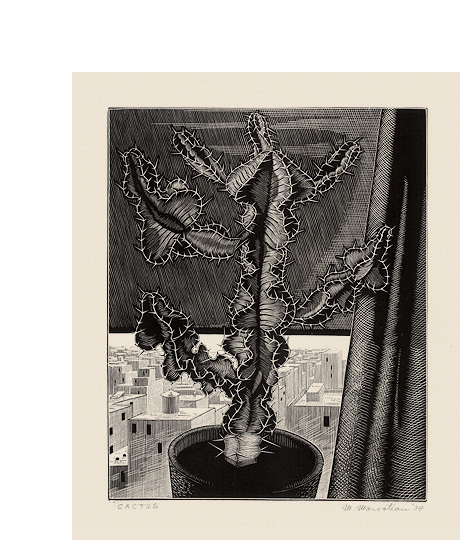 Image size 7 7/8 x 6 3/8 inches (200 x 162 mm); sheet size 10 7/8 x 8 3/16 inches (276 x 208 mm). A fine, black impression, on cream wove paper, with full margins (3/4 to 1 7/16 inches), in excellent condition. 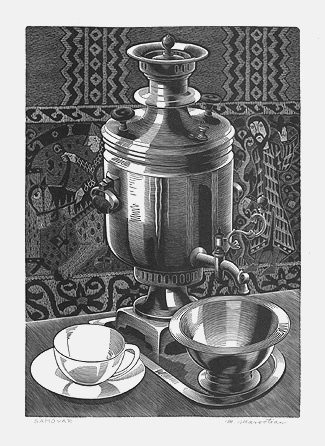 Samovar - - c.1934, Wood Engraving. Image size 8 9/16 x 6 inches (217 x 152 mm); sheet size 12 1/8 x 9 inches (308 x 229 mm). A fine, black impression, on cream Japan, with full margins (1 1/4 to 2 inches), in excellent condition. 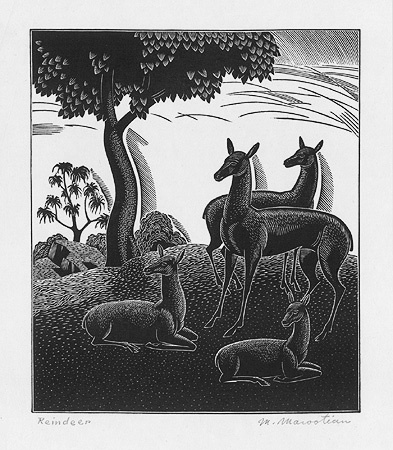 Reindeer - - c.1935, Wood Engraving. Image size 5 5/16 x 4 9/16 inches (135 x 116 mm); sheet size 8 15/16 x 6 7/16 inches (227 x 163 mm). A fine, black impression, on cream Japan, with full margins (3/4 to 2 1/4 inches), in excellent condition. 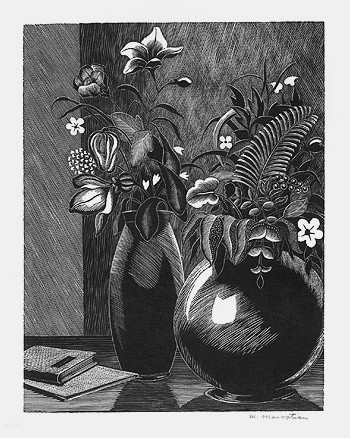 Untitled (Still Life with Flowers) - - c.1935, Wood Engraving. Image size 6 7/16 x 5 inches (164 x 127 mm); sheet size 9 3/16 x 7 3/16 inches (233 x 183 mm). A fine, black impression, on cream Japan, with full margins (1 1/16 to 1 1/2 inches), in excellent condition. 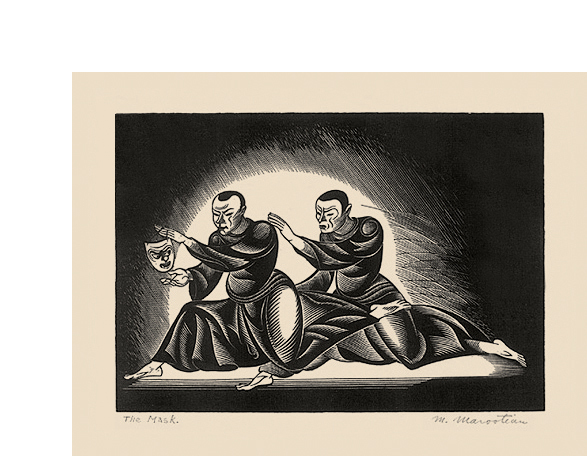 The Mask - - c.1935, Wood Engraving. Image size 4 7/16 x 6 3/8 inches (113 x 162 mm); sheet size 7 1/4 x 9 1/4 inches (184 x 235 mm). A fine, black impression, on buff wove paper, with full margins (1 1/4 to 1 1/2 inches), in excellent condition. 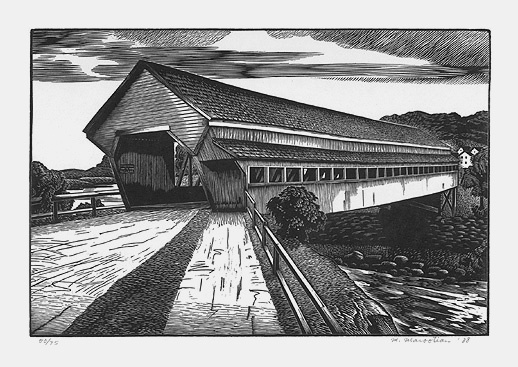 Untitled (Covered Bridge) - - 1938, Wood Engraving. Edition 75. Signed, dated and numbered 50/75 in pencil. Image size 5 1/2 x 8 1/4 inches (140 x 210 mm); sheet size 8 7/8 x 11 3/4 inches (225 x 298 mm). A fine, black impression, on cream wove paper, with full margins (1 1/8 to 1 13/16 inches), in excellent condition.